Sometimes life deals you events that make it impossible to provide the kind of home your Whippet needs. We’ve seen disaster strike families all too frequently in recent years where it became impossible to provide for a beloved Whippet. This is when you call on WRAP to help. WRAP’s extensive all-volunteer network provides assistance to Whippet owners who find it necessary to place their beloved pet. Contact a volunteer in your area and they will walk you through what is needed to get your Whippet into foster care in preparation to finding him or her a new, loving forever home. Health Record including dates of last inoculations, vet checks, health history and rabies vaccination so we can continue to provide veterinary care. A signed release form. This gives WRAP your permission to find a new home for your dog. 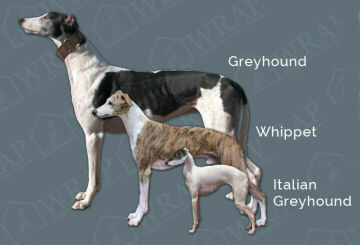 If your Whippet is currently on medication for a health condition, any remaining medicines you might have.